Close bonds between the people of the African continent and the Caribbean island-nation of Cuba have been centuries in the making. Africans caught in the Atlantic Slave Trade were taken to Cuba where their presence made an indelible mark on the character of the political, economic and cultural fabric of the country. Since the 1960s, in the early aftermath of the 1959 seizure of power by revolutionary forces led by Fidel Castro, Che Guevara and others, African independence and transformative struggles have constituted a major factor in Cuban foreign policy. President Castro noted in 1976 that socialist Cuba was populated by a Latin African people opposed to colonialism, racism and imperialism. The first of these conferences was held in South Africa in 1995 just one year after the demise of the racist-apartheid system that brought President Nelson Mandela and the African National Congress (ANC) to power. Subsequent gatherings took place in Ghana during 1997, Angola in 2010 and Ethiopia, the headquarters of the African Union (AU), in 2012. 1967 marks the 50th anniversary of the martyrdom of Che Guevara in Bolivia while he was in the South American country assisting revolutionary forces fighting against the neo-colonial regime which was supported by the United States. The Cuban Revolution from its inception posed a challenge to American imperialist dominance over the Caribbean, South America and other colonial and neo-colonial territories around the world. In November 2016, 90-year old former President Fidel Castro passed away in Havana. His funeral was attended by many African leaders including Namibian President Hage Geingob who paid tribute to the revolutionary leader in an address to the mourners. Under the previous U.S. administration of President Barack Obama, the reestablishment of diplomatic relations with Cuba after a breach of over 50 years raised expectations of a possible lifting of the economic blockade imposed by Washington in October 1960. Without the abolition of the blockade relations cannot be fully normalized despite the exchange of diplomats and the reopening of embassies. The U.S. Congress would have to approve the liquidation of the blockade and there are political elements within the legislature which categorically opposes full economic and trade relations with Havana. 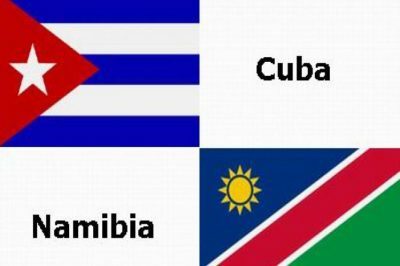 Geingob emphasized the urgency of the conference to develop a unified African strategy in regard to supporting Cuba. In addition, the delegates passed resolutions demanding the return of Guantanamo Bay, which remains over a century later after the so-called Spanish-American war under U.S. control, to the Cuban people. African leaders viewed the current situation involving the status of U.S.-Cuban relations as being critical in light of the political character of the administration in Washington. President Donald Trump does have the prerogative of reversing the reforms instituted by his predecessor. Moreover, the struggle to maintain and enhance the independence and sovereignty of Cuba is linked with other countries within the region. In recognizing this reality the conference expanded its scope to encompass other states which have also been under pressure from successive U.S. administrations. 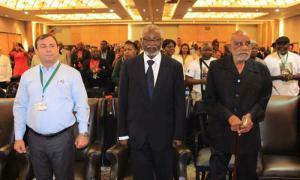 In attendance as well from Cuba were Fernado González, president of the Cuban Institute of Friendship with the Peoples (ICAP) and Cuban Ambassador in Namibia, Giraldo Mazola. In 1961 in the aftermath of the assassination of Congolese Prime Minister Patrice Lumumba, Cuban Minister of Economic Planning Che Guevara spoke out strongly in condemnation of the murderous act which was carried out by the U.S., Belgium and other imperialist states utilizing local surrogates. Che during 1965 toured Africa in an effort to build solidarity and make preparations for Cuban internationalists intervention in Congo aimed at supporting the revolutionary forces fighting for the ideals of Lumumba. Although this mission was not successful, the experience taught profound lessons which laid the foundation for the deployment of Cuban military units a decade later in Angola in defense of the Popular Movement for the Liberation of Angola (MPLA) beginning in October 1975. President Fidel Castro was requested to send support by Angolan President Agostino Neto in the face of an invasion by the South African Defense Forces (SADF), the Central Intelligence Agency (CIA) and the surrogate U.S.-backed UNITA and FNLA rebel groups designed to derail the genuine independence of the oil-rich former Portuguese colony. Cuban Internationalists spent another 13 years in Angola where they assisted in defeating the SADF in a series of battles around Cuito Cuanavale in 1988. After the humiliating losses by the SADF, negotiations began which resulted in the liberation of Namibia, the release of South African political prisoners in 1990 and the transition to non-racial democratic rule in the citadel of apartheid settler-colonialism by 1994. 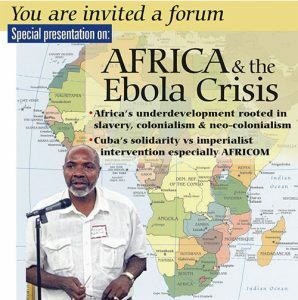 During the Ebola Virus Disease (EVD) pandemic of 2014, Cuba deployed hundreds of physicians and other healthcare workers to Liberia and Sierra Leone, two of the hardest hit West African states, which was instrumental in turning the tide in efforts to halt and eradicate the crisis. The U.S. was forced to recognize the role of Cuba in the battle against EVD which paved the way for the reopening of diplomatic relations. Outside of the conference deliberations in Windhoek, the delegates visited historic sites including Heroes Acre and the Museum of Independence on June 7. The participants decided in its conclusion that the Federal Republic of Nigeria will be the venue of the next Continental African Conference in Solidarity with Cuba. All images in this article are from the author except the featured image which is from Prensa Latina.